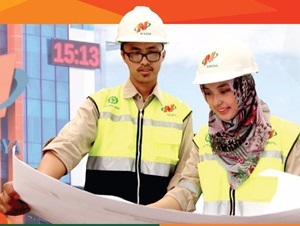 PT Nindya Karya (Persero) - Nindya Karya is a reputable state-owned company in Indonesia established in 1961 and running business in construction, EPC and investment. PT Nindya Karya (Persero) is a member of PT Perusahaan Pengelola Aset (Persero) or PT PPA, a reputable state-owned financial and asset management company in Indonesia. At present, Nindya Karya is 99% owned by PT Perusahaan Pengelola Aset (Persero) or PT PPA (Persero) and 1% by the Government of Indonesia. Based in Jakarta, Nindya Karya now has 7 regions throughout Indonesia and 2 divisions; EPC and property. Nindya Karya also supported by 2 subsidiary/affiliated companies, namely PT Nindya Beton and PT Marga Kunciran Cengkareng. Its head office is located at Jl Letjend MT Haryono Kav 22 Jakarta 13630. Nindya Karya supported by 658 employees, including 273 permanent employees and 385 non permanent employees. Nindya Karya’s performance in 2016 showed a significant increase compared to 2015. According to PT Nindya Karya (Persero) Annual Report 2016 as cited by JobsCDC.com, Nindya Karya booked income of the year 2016 amounted to Rp180.05 billion. This number increased by 162.38% compared to Rp68.62 billion in 2015. The total revenue in 2016 was Rp4.66 trillion, 101.24% from the target RKAP 2016 of Rp4.60 trillion. Compared to the achievement in 2015, it was an increase of 29.08% from Rp3.61 trillion. Bachelor Degree (S1) in Civil Engineering (Structure). Bachelor Degree (S1) in Economic Accounting. Diploma Degree (D3) in Economic Taxation. Graduates from a reputable university (PTN / PTS) with minimum accreditation A.
Legalized copy of transcript with minimum GPA of 3.00. Fluent in English, both oral and written with minimum TOEFL score of 500 as evidenced by the TOEFL certificate from the Foreign Language Institute. Copy of valid identity cared/KTP. Maximum age of 27 years old on 31 November 2017. Test location : Jakarta, Medan, Semarang, Surabaya and Makassar. JobsCDC.com now available on android device. Download now on Google Play here. Please be aware of recruitment fraud. The entire stage of this selection process is free of charge. PT Nindya Karya (Persero) - D3, S1 Regular Program IV Nindya Karya October 2017 will never ask for fees or upfront payments for any purposes during the recruitment process such as transportation and accommodation.